Since most of my recent longer posts have been about Ancient Egypt, and since the quick flight posts have been about music, I’ll converge both in this pic of an instrument I bought in Egypt: an oud. The oud is the ancestor of the modern lute, the most popular stringed instrument during the European Renaissance. But it doesn’t have frets. You can thus play scales with shorter intervals between notes. 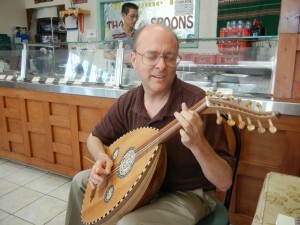 Many Middle Eastern scales are based on the quarter tone, rather than the half tone. These shorter intervals allow a lot of nuances in emotional expression. The oud has a very soft and warm sound. Its rounded body is so light that the combination of sound and touch stays with you for many hours after you play it. The notes ripple through your body and relax you. Why am I playing it in a Thai restaurant? 1. I’m in California, home to lots of cultural cocktails. 2. I’m in Thai Spoons, in Sunnyvale–its owners are very nice friends. 3. Thai culture is also full of graceful patterns. 4. As nice as the owners are, they would probably throw me out if I brought one of my electric guitars.